Great news! 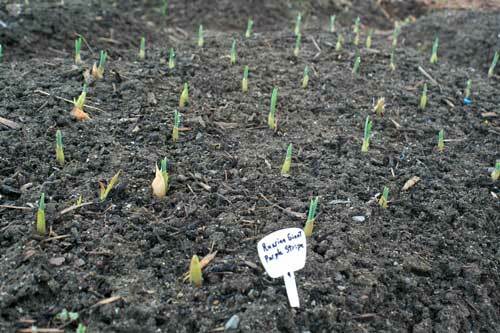 Garlic is up all over the garden and it is looking strong! Of course, we would expect a good showing on the Chinese Pink, a Turban variety, known for maturing early. This is our first year for growing this particular variety, and we are looking forward to it being ready early in the season, right about the time when we are ready to trade our first-born children for fresh garlic. The second photo is of the Russian Giants, a Purple Stripe variety that has done quite well for us and has been high in demand in recent years. Although shorter than the Chinese Pink at this point, it is still looking good. We have a little international competition going on in our own backyard, which just goes to show why you have to grow a little bit of everything, because every kind has its strengths and unique qualities. The love of garlic unites us all. And the love of grandchildren. Which is why I wouldn’t really trade my first-born child – surely, she knows that. The problem, though, is that it is still mid-February, which means we are sure to get lots of wet weather, frost, and a good freeze or two. A couple years ago, we even got snow on April 1. So anything can and will happen. Strong winds are a sure bet. Keep in mind, though – garlics are like our ethnic ancestors (in my case, Italian) – a hardworking, hardy bunch, determined to survive. They can handle the freezes, sleet, snow, and rain we get at this time of year. The wind might bend them over sideways, but once it lets up, they reach back up for the sun. But if they are engulfed for months at a time in a wet blanket that fosters a lot of mold, they will succumb. Trust me. My garlic plants usually have yellow tips on the leaves later in the season, and I think the extreme weather changes at this time of year is a large factor in that. However, if you provide drainage (raised beds! ), and if they can breathe (key word, here), they will pull through the vagaries of weather just fine. Estonian Red — know nothing. We both have a weakness for trying new garlic. With 13 varieties in the ground and 3 more in my food cache, I’m trying to cut down but probably won’t and got an eye on a couple new varieties from your dirt. *** Chinese Pink — didn’t believe Terratorial’s write up, but indeed it did deliver over 4 weeks earlier than any other last year in what was a v e r y s l o w season. 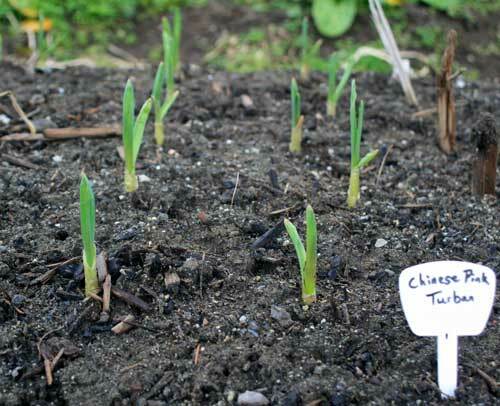 Dug around the bulbs of a few to confirm when to dig … looked for clove definition, bulb size and/or 1-2 brown leaves. Bulb Size was larger than expected from the size of the plants. Very Mild. *** 1 inch of cut grass mulch which was removed last week. Not a single baby weed! *** Siberian (and Bavarian Purple) in the South. Family live in the Piedmont … near the mountains so it is a little cooler … there are garlic farmers in the vicinity who sell at Farmers’ Markets. Clay soil there so let’s not complain about our silt. BTW — this year Terratorial changed the name of Bavarian Purple to Bavarian RED with the same write up as before for B. PURPLE…. go figure. This is the problem with names. There are likely a lot of garlic varieties that are, in reality, the same. I am trying to track down the origins of my Juan de Fuca Wonders, which I admit, I named because I didn’t know what they were. Course, I’ve been growing these since 1976 – and in the Sequim area since 1987, so they are pretty acclimated to our conditions. There is a very good chance that they might be Spanish Roja – and there is also a good chance that Killarney Red is ALSO Spanish Roja. My understanding from Meredith’s “The Complete Book of Garlic,” though, is that the technology isn’t quite there yet to tell us for sure. Even so, no use compounding the problem, right? The 5 varieties I got from you are all doing very well (look like yours) … Polish White, Siberian, Metechi, German X Hardy, and Romanain Red. The Polish White ‘Eaters’ are in great shape and will be for another couple months. ‘Blossom’, another early Turban, was added to my stable …. estimated 2+ weeks earlier than most garlic but not as early as Chinese Pink at 4+ weeks early but with a slightly hotter flavor. BTW — family from all over the the SE — Virginia, SC and Georgia planted your Siberian, after eating some, and it is in great shape too. Was tempted to heavily mulch this year but learned from you that in ‘our’ marine climate it can be a disaster. The camera loves Barkley … what a handsome dog …. in person too.